Black cutworm larvae are grayish-black and lack obvious identifying characteristics. As a result, they may be confused with other non-pest insects found in corn fields, e.g. crane fly larvae and dingy cutworms. Crane fly larvae are similar in color and are found in many habitats including corn fields. Depending on the specie, crane fly larvae are tapered at each end. Dingy cutworms usually feed on corn leaves but are rarely considered a pest unless they are present in extremely high numbers. Dingy cutworm larvae are very similar in color, shape and size to black cutworms. However, proper identification can be made by looking at the tubercles (black dots) on their backs. Each of these cutworm species will have 4 prominent tubercles/segment. The rear tubercles on black cutworms will be slightly larger (see picture below) than the front pair. Tubercles on dingy cutworm will all be similar in size. Feeding habits also can help with identification. Crane fly larvae do not feed on corn, dingy cutworm are primarily foliar feeders. 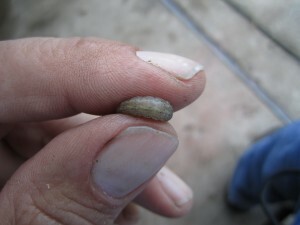 Black cutworm damage is variable and dependent on crop and insect size. First through third instar (< ½ inch) black cutworm larvae are usually not capable of cutting plants but will feed on leaves. This serves as an early warning when larger larvae can start cutting plants and/or burrowing into the stem below ground. Setting a treatment threshold can be difficult because many factors affect economical control including weather, crop and cutworm growth stage. Typically, treatment for black cutworm is suggested when 3-5% of the plants show cutting activity. Spot spraying can be effective if infestations are localized. If organophosphate (IRAC group 1) rescue treatments are to be used there may be interactions with certain herbicides. Read and follow label recommendations closely. What about armyworms? They do migrate at approximately the same time as black cutworm adults and there have been scattered reports of high trap catches. Start spot checking seedling corn and wheat fields. Unlike black cutworm, armyworm females have a strong attraction to grasses when laying eggs. There is an exception. Corn that is no tilled into fall or spring killed alfalfa can be quite attractive. In wheat, they may not be good clues to use when spot checking. However, scouting areas with higher stand density may help. Later in the growing season pay special attention to lodged areas. Previous post: Stripe Rust on Wheat: Stay Alert!